Edward S Curtis lived a full life in his 84 years and we can see evidence of that from the photographs of the American West and of the Native American peoples that he took during his lifetime. He was born on February 16, 1868 and by the time he was 17 he had become an apprentice to a photographer. His first photographic portrait of a Native American was done in 1895 in Washington state. 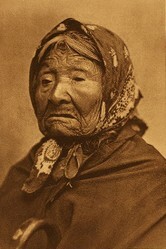 Curtis met and photographed Princess Angeline who was the daughter of Chief Sealth who most of us refer to as Chief Seattle. The photo at the right is of Princess Angeline taken by Edward S Curtis approximately one year before her journey on earth ended. Around 1900, George Bird Grinnell invited Curtis to come on an expedition that he was planning. He wanted Curtis to photograph the Blackfoot Indians that were living in Montana. In 1906 J. P. Morgan the banker and financier offered to pay Edward S Curtis $75,000 to produce a series of photographs of Native Americans. Morgan who was known as a serious art collector wanted 20 volumes with at least 1500 photos. The photo at the left is of Edward Curtis around 1889 before he met and accepted J P Morgan's challenge. Curtis did not want to just take a bunch of photographs of what he felt was one of the great races of humans. He felt an obligation to document as much of the traditional life and culture as he possibly could. It is believed that he took around 40,000 photos of more than 80 different tribal traditions. Curtis did not stop at just photography while working on the series commissioned by J. P. Morgan. He also wrote documentation of tribal lore, traditions, and customs of the people in his photographs. He described tradtional types of foods, the types of housing of each tradition, their clothing styles, and much more. He also recorded both the music of the people and of them speaking so that their language would not be lost. At a time when most North American Natives had been relegated to reservations, Edward Curtis realized that if these pieces of history were not recorded soon, they would be lost to humanity forever. I particularly like the photographs by Edward Curtis that show women in the role as Mother and the babies of the different Native American peoples that he visited. They appeal to me as a Mother and Grandmother. One of my favorites is of an Apsaroke Mother and her child. The English mistakenly referred to the Apsaroke as the Crow Indians. The translation of the word that they called themselves became Crow when it really meant "Sparrowhawk" or "Bird People". The Crow or Apsaroke originally lived along the Missouri River in what is now North Dakota. Another of my very favorite Edward S Curtis photographs is of an Apache baby in a carrier. Geronimo was of the Apache tradition and most non-natives have at least heard of him. The Apache are actually a collective of several cultures that are related by language and tradition. Originally the Apachean peoples lived in areas of eastern Arizona, northwestern Mexico, New Mexico, Texas, and the southern plains. The Navajo are generally excluded from modern reference to the Apache but are related to them and speak one of the Apachean languages. There are also the Jicarilla, Lipan, Mescalero, Chiricahua, Western Apache, and Plains Apache divisions. With something like 40,000 photographs taken by Edward S Curtis and more than 80 tribes represented there are many to choose from if one wants to collect prints of the original photos. What I love about the photos is that there are both tribal traditions that are familiar to many non-Native people and then there are photographs of tribes that are not as well known. I mentioned the Jicarilla Apache above as one of the tribal traditions that Curtis photographed. If we look closely at the many photos of the Apache people in general, we can see the detail of the clothing that they wore or an activity that they may be engaged in. A tribal tradition that I had not been aware of until I obtained a print of a photograph done by Edward S Curtis is the Assiniboine. My curiosity got the better of me and I did some research. The Assiniboine originally inhabited the northern plains of what is now the United States and are one of the divisions of the Sioux Nation. They are the Nakota and some still live in Montana today. While many praise the work of Edward S Curtis and his remarkable photographic images of the First Peoples of North America, others offer criticism of the same work. Many believe that Curtis staged photographs and removed items that were more English out of the photographs and find fault with that technique. Defenders would say that he wanted to record the way of life of a noble people that no longer existed. As much as I appreciate the photographic work of Edward S Curtis, I do wish that he had shown the already deplorable conditions that the Native American people were being forced to live in. He could have done photos of the "old ways" and then done photos of what life in the early 1900s was really like for the indigenous peoples who had their lands and many of their rights stripped from them in the previous century. Perhaps if he had reported the squalor that he was witnessing, the American people might have become outraged and started to work to change things. Then again, maybe not. Thank you for stopping by to see some selected Edward S Curtis photographs and to learn a little of his history. Great collection! I love the way Curtis always gave dignity to the people he photographed. Yes, I'm sure they were staged, and he could have shown squalor, but he chose this way and emphasized their nobility. I have always thought Curtis photographs were incredible, but I had not seen Curtis himself before. We are so lucky to live at a time when we can find these things easily; he was so brave and fortunate to live in a time when he could go through all the difficulties to go out and find these people and preserve their images for the generations to come. What a great piece of American history. These photos are a treasure trove. interesting; I love old photographs .there is a rich story told in photos here. Beautiful :) Criticism of his work is, I think, a misunderstanding of how people looked at that sort of thing then. The idea of depicting everything - of getting at a social issue as objectively as possible, is pretty new. Edward S. Curtis's photos have been some of the best there are to highlight Indian Culture. I have seen his photos many times; you did a good job with this, and I too like the photos you highlighted here. I have appreciated Curtis' photographs for a long time. I understand the criticism that he staged many of the photos, but the spirit of the people themselves still comes through. I sure found it interesting that his work is sometimes criticized and when you explained it, I certainly understood. I'd never heard of Edward S. Curtis. Thanks for this informative article.